GOLDEN, CO August 19, 2015 Golden, Colorado is where the Great Plains meet the Rocky Mountains, and because of this spectacular location, the historic town has been chosen to kick off the final stage of the USA Pro Challenge – an event that will be broadcast nationally on NBC Sports on Sunday, August 23, 2015 beginning at 2 p.m MT. The 7th and final stage of the USA Pro Challenge will begin in Golden, circle North Table Mountain, pass through Golden again, climb Lookout Mountain, and then come through Golden one more time before heading on 32nd Ave to the race’s conclusion in downtown Denver at Civic Center Park. The highlight of the final stage of the race will be the 4.3 mile, 1,300-foot climb up Lookout Mountain – the historic peak that towers over Golden and is the site of the grave of the famous frontier scout and showman, Buffalo Bill Cody. The road up Lookout Mountain is part of the Lariat Loop National Scenic Byway, a collection of early automobile roads built in 1914 to connect the parks of the Denver Mountain Park system, including Red Rocks, Mount Falcon and Buffalo Bill’s Grave. Golden is known as one of the most popular biking capitals in Colorado. Here you can find all types of cycling adventures. Many pedal for more than twenty miles along fast rushing Clear Creek following the route from Denver to the mountains taken by gold seekers 150 years ago. 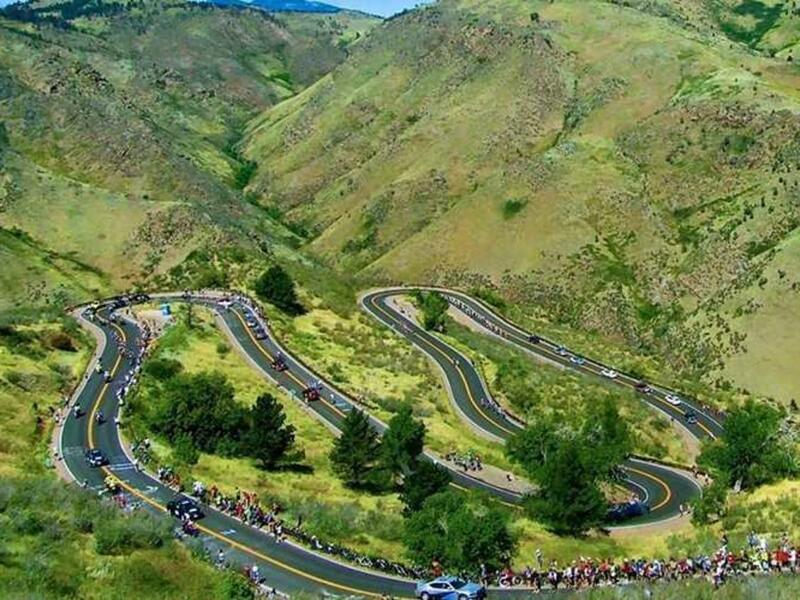 But the most popular Golden bike ride is to gear down and try to pedal up one of the Colorado’s most iconic hill climbs – the twisting road to the top of Lookout Mountain. The paved road snakes, twists and turns, climbing 1,300-feet in 4.3 miles at grades that average 6-7 percent, from historic downtown Golden to the 7,379-foot summit of Lookout Mountain. It will be possible to watch the race from anywhere along the road, which will be closed to automobile traffic starting around 12:30 p.m. on Sunday August 23. The scenic road was designed by Frederick Law Olmsted, Jr., son of the famed landscape architect who created Central Park in New York. While it is a challenging climb for bikers, others can simply drive to the top, enjoying the same incredible views of Golden, the foothills and the far off snowcapped peaks. At the top, stop at Buffalo Bill’s Museum and Grave for a historical tour with information about Buffalo Bill’s experiences as a frontier army scout, pony express rider and showman. There is also a spectacular outdoor viewing deck that looks out over Denver and the plains.